Tributes are coming in for Rodney Milnes, chief opera critic of the London Times from 1992 to 2002. Rodney died last night in Gloucestershire after a long illness at the age of 79. In addition to his duties for the Times, Rodney was editor and part-owner of Opera magazine. A shy, private man, astute and with a gentle sense of humour he was universally liked and respected by his fellow-critics. 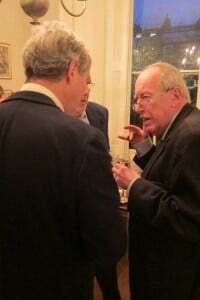 When he retired from the Times, feeling he still had much to give, I tried over a drink to hire him for the Evening Standard, of which I was assistant editor. Rodney couldn’t say no. Nor did he want to say yes. So we had a couple of drinks and left it at that, never mentioning the matter again except with the faintest of twinkles in his eye. Hugh Canning tweeted: ‘RIP Rodney Milnes, the most astute & wittiest opera critic of his generation, a wonderful editor of Opera magazine & friend’. Rodney was an ultra-fastidious, thoroughly decent man, dedicated to his art and his craft. In recent years, he withdrew to Gloucestershire to live close to his sister, who died earlier this year. Rodney’s passing marks the last of his London generation, following the deaths in the past 12 months of Michael Kennedy, Andrew Porter and Edward Greenfield. I will never forget my conversations with Rodney at interviews and simply talking with him at performance intervals in London. He was a lovely person and such a fount of Operatic knowledge. RIP. We will likely never see his equal again. Very sad. Highly respected. RIP. One of the most knowledgable, readable, sensible and passionate people writing about opera. We trusted him and his opinions and the critical world is a poorer place without him. This news is so very sad. A wonderful human being, shy, reticent with a wicked twinkle in his eye and possessed of great critical perception and sensitivity. So important however was his readiness to display civil courage in the face of philistinism in difficult times for the arts. He is and will be painfully missed at a time when dark clouds of political threat hang over some of the UK’s major opera companies. A very sad loss.An important and humane voice during a time when music criticism was important. Rodney was a marvellous man and always a delight. He was a serious watcher and listener and had a deep understanding of what we are trying to do. I shall miss him very much. Rodney was unique — a brilliant, oddly self-effacing critic, an astute historian, an accomplished , ultraprofessional journalist, a great wit, a sensitive colleague and, yes, a good friend. Profound sadness. He was the man who wrote, Karajan was a bad man and a bad conductor. The world will be a better place without him.” May I return the compliment to Rodney Blumer? I think you’ll find yourself in a very small minority. Do you find it acceptable to write of someone who has died “the world will be a better place without him”? Further, one may not like Karajan’s music making but to call him a bad conductor seems to me to btray a sorry lack of judgement. Are you trying to tell us something by referring to him as Rodney Blumer? Don’t be shy! His full name was Rodney Milnes Blumer. Occasionally he used his actual surname, for instance when writing notes for recordings. Actually, he used “Blumeroo” as his email name. Rodney was a delightful, gentle and engaging man and a huge fan of Music Theatre London at a time when our attempts to demystify opera were derided by some less enlightened critics. But of course what made him a great critic was the depth of his love and knowledge of music and opera in all its manifestations. Very sad news. I wonder where he said that of Karajan. Any reference? Or just bad talk? Rodney Milness and Harold Rosenthal are the critics I partly grew up with. Honestly compels me to say that their Anglo-centred attitude -pushing British singers/conductors etc often ennerved me. It was in “The Spectator”, July 29th 1989. It was in the same magazine in 1971 that he wrote, “Solti’s reign at Covent Garden is nearly over, thank goodness.” A silly, unfair remark, especially as it wasn’t backed up by any justifications. I also felt his comments on Karajan were completely out of place and totally unacceptable. At the time I wrote to Mr Milne’s and made my views known. He never responded. Thank you for all the lovely comments. My uncle Rodney is much missed. Stephen, courageous though it is to speak ill of the dead (especially when using only a first name) I think possibly a little insensitive. Please do post your whereabouts and we can have this conversation in person. If not do feel free to bu*ger off. Uncle Rodney did not hesitate to speak ill and spitefully of the great maestro von Karajan, and in a manner unworthy of all except second-rate hack critics. I have no wish to meet Milnes’s niece, thanks all the same. I have been reading Rodney’s entertaining reviews in Opera for many years. His unique style meant it was possible to spot that this was ‘a Rodney Milnes’ even before I reached the end of the review. He and I did have a brief correspondence about his thoughts on writing ‘The Tenor as Love Rat’ back in the 90s, but sadly this book was nothing more than just a thought. What a shame. It would have been hilarious. I shall miss his reviews so very much. This my tribute to Rodney Milnes. Rodney was a very close personal friend of mine for nearly 40 years. I met him through a mutual friend when I was a young music student at the San Francisco Conservatory. We immediately hit it off and spent many happy times for many years together. I’ve kept all his letters, pictures, books and gifts; not to mention a vivid recollection of his thoughts and opinions regarding the events, times and people he encountered as a journalist and critic during his long and illustrious career. Few people, if any, knew Rodney Milnes as I knew him. Rodney loved life! He loved great food; his smoked salmon, his claret, his cigarettes and a good laugh. He was very serious about his work; but once he was off duty, he could also be lots of fun. He was my dearest friend and mentor. He taught me everything I know about Poulenc Motets, the German language and how to sight-read vastly complex orchestral scores. And yes, Rodney, when he wanted to, played the piano masterfully and sang extremely well, in his deep and resonant bass voice. I remember him playing the piano and singing from memory (all the parts) from a huge section of Tristan & Isolde. I was amazed and speechless! We also shared a mutual love and deep admiration for his beloved friend and soulmate, the late designer, Elizabeth Dalton. If you ever wanted a really good laugh, you had only to get Rodney and Liz together. They’d have you on floor doubled up with laughter and good times. Indeed, it was a great honor to be accepted by and into Rodney’s inner circle.